I'm not one to photograph my food. Maybe twice while traveling in Turkey did I feel the need to document my nibbles. Perhaps it's because there's an art to photographing food that takes care and an attention to detail I just don't have when I'm hungry. But I'm not going to do a post on food photography without a picture of food, and I sure as heck ain't going to use a stock photo on a blog about learning. So here's my breakfast. We'll talk about it later. Take time with your set-up: the food on the plate, the plate and silverware, the table or background. It's an "art piece." Food that glistens is visually appetizing; brushing a little oil onto the food can give it that glow. So let's go back to my breakfast up top. For this I used an inset window for my key light (behind) and tin foil as a reflector-fill. What doesn't work about the image? First off, it's pretty boring. Corn flakes? Come on. 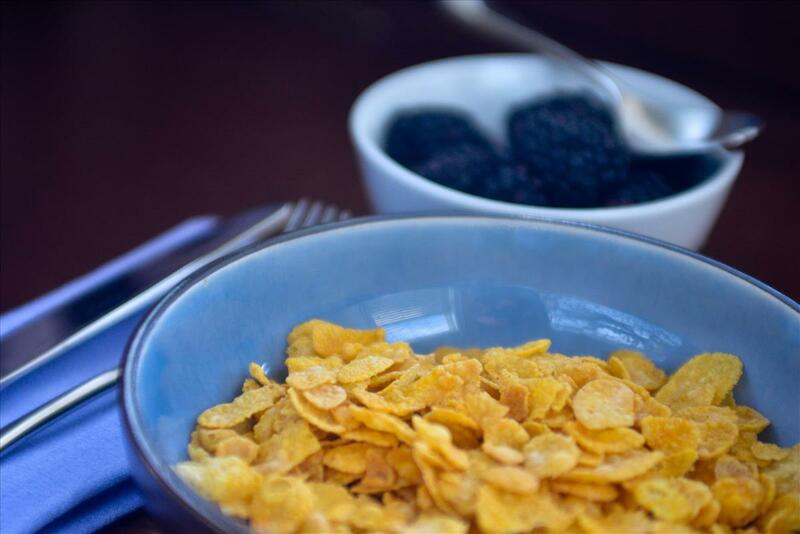 Compositionally, it's a little difficult to discern what the "subject" of the photo is-- is it the cereal or the fruit? The knife and fork should be pushed a little farther away so we can see them more clearly. The blackberries aren't the best contrasting color; they're a bit dark. You might also notice that the colors are a bit weird. It's not that way in the actual image-- BlogSpot messes with the colors when I upload. Does anybody know how to fix this? It's being bugging me since Day One. Fine. So what works about the image: though the subject is unclear the composition is interesting. The spoon brings the diner into the image and reflects nicely. The blue bowl and napkin match each other, and contrasts with the cereal; and the brown wood table (in the original image) has a nice warmth to it. And the corn flakes are organic. Looks tasty.